Women and children killed, people crucified. All this happening in the glare of the worlds media. The breakdown of the Iraq state has been sudden and devastating, especially for people from minority faiths such as the Yazidis and Christians, with hundreds of thousands fleeing the inhuman brutality of the Islamic State forces. 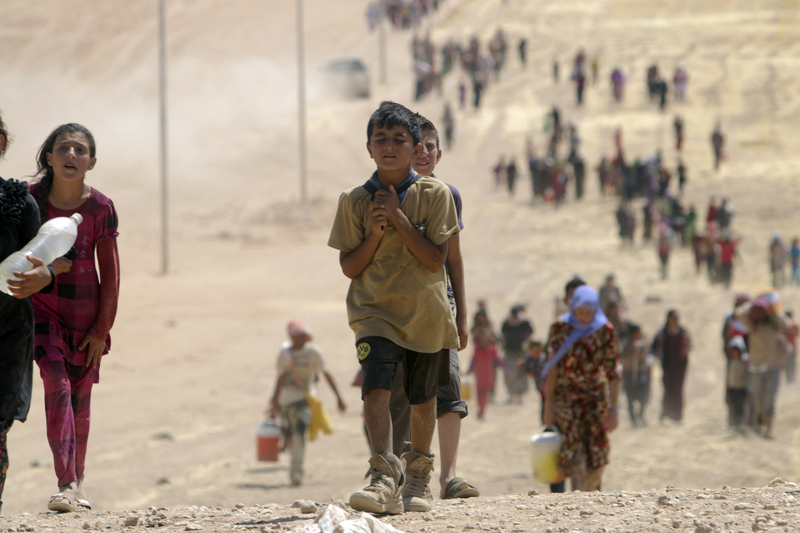 The situation for Christians has been dreadful for years (it is believed that nearly a million Christians have fled from Iraq out of 1.5 million since the invasion of Iraq). Firstly, we can pray. As Christians we bring to God not only our own needs but also the needs of others. As Christians we believe that God hears these prayers and cries. We may not understand how he always answers our prayers but we do know that prayer changes things. Prayer helps us to focus on what is really important, it helps us work out the essence of the issue. Prayer helps us to engage with the issue at hand. It involves us and God seems to use that to enable things to happen. Secondly, we can act. Here there is a really practical response that we can make. The Kurdish region in the north of Iraq has thousands upon thousands of refugees. There is a huge humanitarian need. After discussion with staff and wardens at Springfield Church we are having a collection in aid of the humanitarian help for the refugees. We looked at a number of charities that we could go through and have chosen Christian Aid as they already have a significant presence in the Kurdish region and are well placed to help and I have asked Helen, who works for them, to share some of what is going on and what we can do on Sunday. Thirdly, we can lobby our government and MP’s to ensure that this stays on the agenda of the government and that aid and assistance are sent to help. Some in parliament can be incredibly ignorant about the status of Christians in the Middle East. Rowan William’s biographer wrote recently “Rowan raised the matter of Christians under threat in the Middle East with a member of Gordon Brown’s cabinet, and received a jaw-dropping response. ‘If missionaries will march into Muslim countries trying to convert them, then it’s not surprising that they have a hard time. '” If a cabinet minister was so ignorant we need to ensure that people realise that the Christian communities of the Middle East have been there for two thousand years! There will be a box at the back of Church for you to give for the refugee crisis in Iraq for the next few Sundays. Alternatively, if you want to give to Christian Aid direct then their appeal page is here: http://bit.ly/1q9GTNS. Well Mr. Cookson, again you have proved there is nothing coming out of your tiny brain but jokes, unfortunately lots of people reads your articles and they don’t know anything about middle east and therefore people like you give them the ideas to paint the image you want them to believe in it. Hundreds of Christians killed almost every day in Syria Palestine and Iraq, do you really think those people was killed because Muslims want to convert them, if that’s true why the other Muslims refuse the action of “DAISH” and they fight them, you think what you call it Islam state in Iraq has any thing to do with Islam? ?… Believe me if it happen in the future and there will be an Islam state you will be the first one want to live in it, but unfortunately currently the middle eastern countries corrupted with ideas from from the west, this DAISH “as for your understanding Islam state” it’s the new title for Qaeda and who created this organization?? And if you think for a moment there is one real Muslim accept those people action you will be absolutely mistaken, even Islamist rules refuse their actions. Go ahead every one make your gestures for the one who needed the most and may God repay the good deeds doubled, but don’t let those people like Cookson play with your mind, the world is beautiful place to live in and thank God for that, the extremists has no path to reach freemen. We have brains to read and search for the truth, some people trying to mess with our head to keep the war going on in the world for some benefits to them and we have been like toy in their hands for decades and that shall end already. May God give those who lost a family member or friend the strength to pass the time by. And may God expose those who tries to make more conflicts at a time we really need to know who we can trust. After all, we all human beings and our religion and beliefs are between us and the mighty creator. Sorry, but I’m not sure what line you are taking here. I used the term Islamic State because that is what they call themselves but I also called them a cult rather than a religion to separate them from others in Islam who see things differently. I do agree that there are many muslims who disagree with their actions and I do not imply in any way that most muslims agree with their ideology. May The God Of Heaven add to, multiply your efforts and the effect of your charity among those you seek to aid. May He also direct your good works. In Christ Jesus’ Name AMEN. So many of us feel powerless and helpless in the face of such torment and persecution. The last century gone has seen more more martyrs for Jesus than all the centuries previous put together. It seems that this century is going to try and top even that. No one here is (yet) putting a gun to our heads or threatening to behead us for our adherence to The Lord Jesus. The word there is ‘yet’. The exploitation of faith and faith groups by those seeking power and position and prestige has been with us since the early days of the church; thus the canker from within eats away the credibility of that faith group. Externally there have been many attempts to manipulate faith groups to further some one else’s political or economic ends. This, I regret, includes the followers of Islam as much as the followers of any faith group. I would that it were not so but human nature, corrupt as it is from the fall and it’s disassociation from The Divine, from God Himself, lends us to the notion that we may take the place and position of God and turn it to our own ends. This brought down the angel Lucifer; are we any better? So, regardless of our faith calling, this as a consequence of being a fallen human being, we seek power to redress presumed wrongs and injustices, feeling our voices not heard; we then use our religious and ethnic groupings and their writings to justify our actions (or inaction); then, we slaughter the innocents in the name of whatever god or faith we find expedient to call upon to justify our actions. It is then in the shadows, the greater powers; sensing blood or jeopardy of their own interests move. An arms shipment here (Just where did the IS get all it’s weapons from?) monies there (Armies cost a lot to feed, transport and equip; ammunition does not come free.) a blind eye turned here, a back hander there. What ever else is said, someone is sponsoring this slaughter. “By their fruits you will get knowledge of them. Do men get grapes from thorns or figs from thistles? Even so, every good tree gives good fruit; but the bad tree gives evil fruit. It is not possible for a good tree to give bad fruit, and a bad tree will not give good fruit. Every tree which does not give good fruit is cut down and put in the fire. So by their fruits you will get knowledge of them.”. All faith groups of all kinds should be on their guard for such persons. It is not those who corrupt your doctrines or misuse your scriptures you should fear but those who drive you to actions uncharacteristic of the god you serve. If you serve a god who is compassionate then cutting someone’s head off is not the compassionate action of that god. If you serve the True God of Love and do not love (agape) then what is your fruit like? Not like that of your God I’ll warrant. To disguise one’s self, to subvert the purpose of the group to one’s own ends (and those ends being inimical to others) is to become in the popular press, a radicaliser. There is nothing wrong with being radical as long as your radical rhetoric and nature does no harm, promotes no harm to others. By all means, convince them to repent of their ways, consider what they are doing as in error or is sinful or just plain wrong. But to seek to radicalise others just, to justify the use of force or violence, to further your own ends to the detriment of still other groups, stirring up decent for your own ends is just plain wrong. It is the activity of the wolf. (Act 5:34-39 (BBE)) “But one of the Sanhedrin, a Pharisee named Gamaliel, a man of learning in the law, of whom all the people had a high opinion, got up and made a suggestion for the men to be put outside for a little time. And he said to them, “Men of Israel, take care what you do about these men. For before this there was Theudas, who said he was someone important, to whom about four hundred men gave their support: he was put to death, and his band was broken up and came to nothing. After this man, there was Judas of Galilee, at the time of the numbering, and some of the people went after him: he was put to death, and all his supporters were put to flight. And now I say to you, Do nothing to these men, but let them be: for if this teaching or this work is of men, it will come to nothing: But if it is of God, you will not be able to overcome them, and you are in danger of fighting against God.”. This was after a reported miracle and testament that these “The Way” people went about doing good; not the behaviour of wolves. Ultimately, do what you will for selfish ends: it will rebound on you. Do what you can for good: it will rebound to you. A fable concerning a wolf that disguises itself in a sheep’s skin is told by the 12th century Greek rhetorician Nikephoros Basilakis in a work called Progymnasmata. It is prefaced with the comment that ‘You can get into trouble by wearing a disguise’ and is followed by the illustrative story. ‘A wolf once decided to change his nature by changing his appearance, and thus get plenty to eat. He put on a sheepskin and accompanied the flock to the pasture. The shepherd was fooled by the disguise. When night fell, the shepherd shut up the wolf in the fold with the rest of the sheep and as the fence was placed across the entrance, the sheepfold was securely closed off. But when the shepherd wanted a sheep for his supper, he took his knife and killed the wolf.’. Let those who seek to distort the nature of faith groups beware! Let those who lead men in the path of violence for their own sake beware! You may wind up as somebodies supper! Very glad you have taken this decision. We’ll be there on Sunday to hear Helen’s report and get involved. Thanks. I was hearing last night on the radio that there are now nearly 1 million refugees in the Kurdish part of Iraq alone! We need to do something however small. DIstance and a few other things inhibit me from being involved with what you guys are doing/planning but I only applaud what you are doing. “…I’m gonna do what Jesus would do; I’m gonna get involved.”. We are not arrogant enough to protest that we have all the solutions. We don’t have the resources to fix it all. We do what little we can: we get involved.